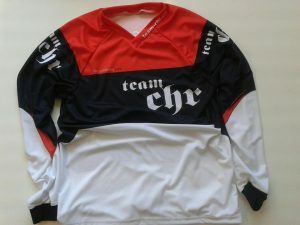 Team CHR is a mountainbike club with the emphasis on racing, we have members who race at events all over the UK and Europe in both downhill and enduro but we are also ideal for the rider who is looking to build towards doing their first event or young riders who are not yet old enough and our club timing days are a perfect taster to get used to race etiquette and format in a relaxed fun atmosphere without any pressure. Of course for those that are not into racing there is also plenty social rides and banter and our monthly club ride is the ideal chance to meet other riders. Chance to take part in our club timing days, we usually have approx. 5 of these a year, where a short track is taped in local woods, we practice on the Sunday morning then everyone has 2 timed runs in the afternoon. Use of club Freelap timing poles and watches – again take these away anytime you want. Chance to take part in the club Strava Trail racing series…….Summer and Winter series with prizes for everyone who takes part. Race tops £40 , specially ordered with name printed across shoulders. Bobble hats £10, Baseball caps (with red logo) £10 each or buy both for £16. 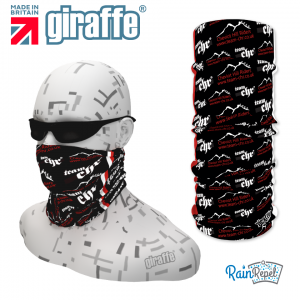 Caps with ‘racing’ logo are special edition as a thank you to members who wear the club colours and represent us at races throughout the country at their own expense. 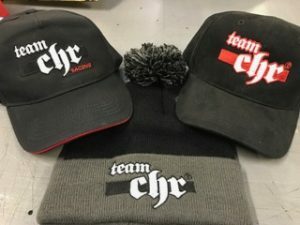 To claim a FREE ‘racing’ cap all you have to do is be a current member and show us at least 3 results within a calendar year (2016 onwards) on roots and rain, with Team CHR as your club/sponsor and preferably a pic of you wearing your club top.